It’s funny to think back to America’s early history. The United States is such a major world player now that it’s hard to imagine a time when it was nothing more than a small, fragile outpost in an undesirable location because the Spanish, who were far stronger than the British, dominated Central and South America. Gold, civilizations, and exotic foods could be found in what would become Latin America, while the future United States was dominated by trees, colder weather and tribes of nomadic peoples. There was nothing of immediate value there, but Britain saw an opportunity to create something. Long before the family colonists of Massachusetts, these people were the settlers of Jamestown. There were multiple failed attempts, most notably the lost colony of Roanoake in 1585, but in 1606, King James granted a charter to the Virginia Company, and in December, 120 settlers sailed from London. Six months later, 106 of them landed on the shores of the Chesapeake. They would not see another ship for four months. I think it’s worth just imagining that for a minute, landing on a foreign shore that no European had survived to that point, with not one but two potentially hostile groups surrounding the settlement, with the primary goal being to survive the four months until there was any possibility of contact with anything they had ever known. Not all of them did survive the four months, for when Captain Newport’s ship returned in January, he only found 38 settlers left. Furthermore, three days after his arrival, the settlement burned down and destroyed many of the supplies he had brought with it. 900 settlers joined the settlement over the next three years, but after the winter of 1609-1610, only sixty survived. This population fluctuation continued for many years, with starvation and raids frequently reducing the number of colonists to a mere percent of what it had been just weeks or months before, and with many settlers returning to England. Their relationship with the Algonquin natives was an odd mixture of friendly and hostile. One of the higher ranking chiefs of the nearby tribes was friendly toward the English, while his brother had lived in Spain and was intent on their destruction. 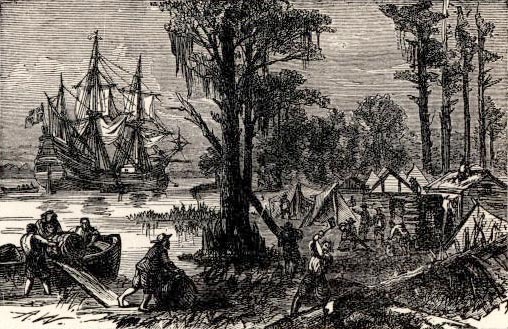 While the colonists would not have survived had it not been for the natives, who showed them the edible plants of the region and even took in some settlers who sought refuge with them in the early days of the colony, battles and raids were among the types of events which frequently and drastically reduced the population of the settlement. The first three years were nearly impossible, characterized by failure, internal strife and hardship. Many who went hoped to find opportunities which simply did not exist there. A change in strategy, however, promised more moderate rewards of upward mobility and free land at the end of seven years’ labor. This brought 1,200 immigrants in two years, though by the end of 1616 only 350 of them remained. Life remained hard, and the colony was still fragile, but as we know today, it survived. This entry was posted in Articles, Education, History, Stories and tagged American History, Colonial America, Jamestown Virginia, Mayflower, Puritans, Virginia Company by STanksalvala. Bookmark the permalink.